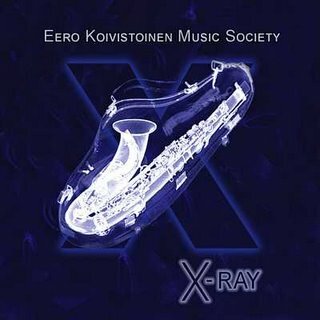 Ha publicado el estupendo saxofonista finlandés Eero Koivistoinen un nuevo disco, "X-Ray", que por lo visto va en la onda funk-jazz de "Wahoo! ", tremendo trabajo de 1973. Entre los colaboradores está Jim Pembroke, mítico (¿?) cantante del grupo finlandés Wigwam. Eero Koivistoinen has returned again to his funk/jazz roots with his new album X-Ray. The 1973 album WAHOO! by Eero Koivistoinen Music Society was rereleased in 2000 and it attained notable success with its UK distributor Whatmusic. With X-Ray, Eero Koivistoinen introduces Music Society updated to 2006. Music Society includes also vocals and rap, performed by Bina Nkwazi, Charles Salter, Hannu Leidén and Redrama. Jim Pembroke makes a contribution with his lyrics. The recordings started with a six-man core group, but on the final product there are twelve musicians, four singers and a rap artist. X-Ray shows the skills of Koivistoinen as a musician, composer and arranger. The recordings were completed at Seawolf Studios with all the newest technology at hand. The ensemble will be performing mainly with the six-man core group, but rap/vocal guests will be joining them occasionally.